After logging 15 consecutive months of gains through January 2018, the winning streak for the S&P 500 ended in February. Market declines early in the month were dramatic, with the S&P 500 slumping 10% over a period of a couple of weeks from the highs in late January to the lows in early February. Volatility spiked as well during this timeframe after an extended period of calm in the markets over the prior year. Almost as noteworthy as the steep early-month declines was the swift recovery in equities from those February lows, with stocks enjoying a rather steady march forward for much of the rest of the month. Despite repairing some of the early-month damage, most major equity indices ended the month in negative territory. The S&P 500, Dow Jones Industrial Average, NASDAQ, Russell 1000, Russell 2000, and Russell 3000 each declined during the month. The S&P 500 fell 3.7%, although it remained in positive territory on a year-to-date basis thanks to strong gains in January. Small cap stocks, as measured by the Russell 2000, declined almost 3.9% in February, once again underperforming their large cap counterparts and pushing this index into negative year-to-date territory. Growth stocks continued to show better relative performance than value stocks in February, although both styles declined for the month. Growth stocks (as measured by the Russell 1000 Growth Index) slid 2.6% compared to larger declines of 4.8% for value stocks (as measured by the Russell 1000 Value Index). In general, international markets struggled more than domestic equities in February. Developed and emerging international stocks dropped by similar amounts in February after emerging markets had been the clear outperformer in January. The MSCI ACWI ex US Index, a measure of developed international equities, dropped about 4.7% in February and the MSCI Emerging Markets Index declined by about the same amount. Due to strength in January, emerging market equities remained comfortably in positive year-to-date territory, while developed international equities remained positive as well but to a more modest extent. Similar to January’s activity, bonds remained under pressure in February as the yield on the 10-year U.S. Treasury continued to rise during the month. While remaining below the significant 3% mark, the yield pierced the 2.95% level in February, but it declined from that point to close the month around 2.86%. This is still a rather notable increase in rates from their year-end level around 2.4% and January’s close at 2.72%. The Federal Open Market Committee (FOMC) did not meet in February, but the handoff in leadership did occur as Janet Yellen wrapped up her tenure at the helm of the Federal Reserve in January and Jerome Powell took over the chairmanship in February. Although there was no FOMC meeting, markets were able to gain some insight into Chairman Powell’s thinking as he testified to Congress late in the month. Following Chairman Powell’s testimony on February 27, equity markets declined and volatility rose to close out the month. With this overall backdrop for bonds, most fixed income sectors declined in February including U.S. Treasuries and investment grade corporate bonds. The widely followed Bloomberg Barclays Aggregate Bond Index declined by 0.95% and high yield bonds fell 0.85%. Declines in February pushed high yield bonds into slightly negative territory year to date after they stood out from most other fixed income sectors with gains in January. The S&P 500 declined in February, marking the first monthly drop for this widely followed U.S. equity index since before the presidential election in 2016. After hitting record highs in January, the major U.S. stock indices, including the S&P 500, Dow Jones Industrial Average, NASDAQ, Russell 1000, Russell 2000, and Russell 3000 dropped lower in February. Following sharp declines early in the month that saw volatility surge to its highest level in years, equities generally improved for the balance of February. Despite solid improvements from those early-month lows, most major equity indices dropped in February. Volatility, which had been rather dormant during 2017, came back with a vengeance during the month. In general, international stocks, both developed and emerging markets, fared worse than U.S. equities for the month. 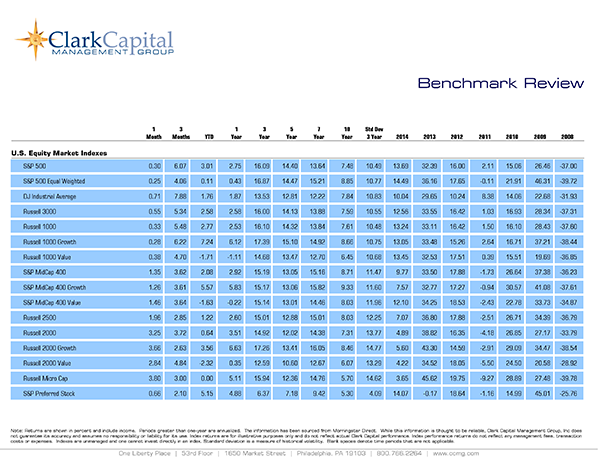 Continuing their recent trend of underperformance, small cap stocks fell modestly further than large caps in February. Style continued to matter for the month as value stocks suffered more significant declines than growth stocks, as the ongoing trend of growth outperforming value remained intact. Despite declines in February, most major U.S. and international equity indices remained in positive year-to-date territory due to strong gains in January. After rising sharply in January, the yield on the 10-year Treasury continued to increase in February, closing the month around 2.86%. At its high in February, the yield on 10-year Treasuries hit 2.95%, marking the highest level for this benchmark indicator since early 2014 and a notable increase from the 2017 close near 2.4%. Overall, this increase in interest rates continued to put pressure on most fixed income sectors for the month. The Bloomberg Barclays Aggregate Bond Index, U.S. Treasuries and investment grade corporates all turned in negative results in February, which pushed year-to-date declines further into negative territory. High yield bonds were one of the only fixed income sectors to show gains in January, but declines in February pushed year-to-date results into modestly negative territory as well. While negative, municipal bonds showed better relative performance for the month. The economy continued to grow in January. The labor market saw 200,000 job additions in January, after job gains in December were more muted coming in at a revised 160,000. The unemployment rate held steady at 4.1% as expected. Once again, the ISM Manufacturing Index and ISM Non-Manufacturing Index continued to show solid economic growth. After back-to-back quarters of gross domestic product (GDP) growth above 3%, the second reading of fourth quarter 2017 GDP growth came in at 2.5%. This was in-line with expectations, but a modest drop from the preliminary estimate of 2.6%. Although no Federal Open Market Committee meeting occurred in February, Chairman Jerome Powell took over leadership of the Federal Reserve and his first significant introduction to the market was during his scheduled testimony to Congress late in the month. While hard to attribute it only to Chairman Powell’s testimony, equity markets declined and volatility rose through month end in the day and a half following his testimony.